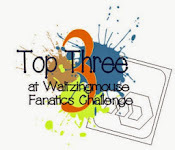 Leo is setting the challenge over at Daring Cardmakers this week and she'd like to see projects featuring a teacup with something in it - it could be just the drink or it could be something else, have a look at the blog to see what the design team put inside theirs! I decided to go small for a change and make an ATC. 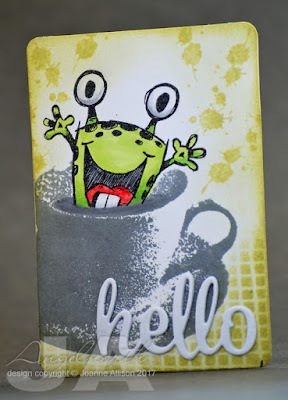 I used the MISTI to let me do some slightly complicated masking so I could stamp my little green monster inside the cup, jumping out to say hello. I hope Leo will forgive the use of an espresso cup rather than a teacup - it was the closest thing I had. Mind you, many years ago we visited Japan and in a lovely hotel in Hiroshima I ordered green tea and a traditional cake. Maybe it was the combination of the sugar in the cake and the "gun powder" style of the tea but it practically gave me hallucinations so green tea can definitely rival espresso for potency! 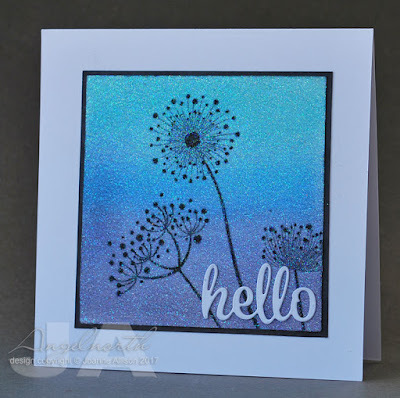 Shabneez is setting this week's challenge at Daring Cardmakers and she'd like us to use plenty of glitter - the only catch is that it can't be gold! I decided to go all-out with the glitter and do a whole sparkly panel. I stamped the stylised flowers first and then covered the whole piece with double sided tape sheet and smothered it with Glamour Dust. 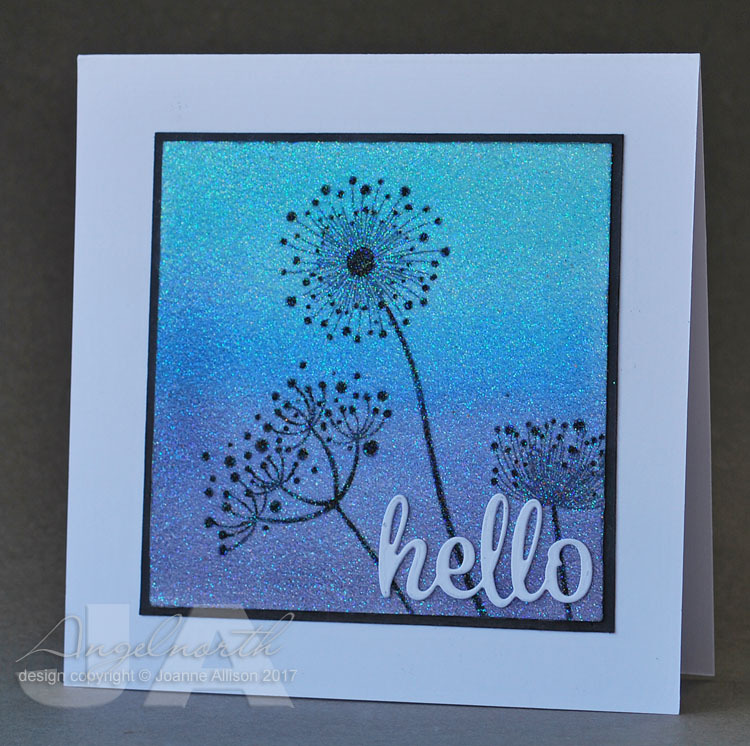 Both the tape and the glitter are transparent so the stamping shows through. If you burnish the glitter into the tape, you get a sort of velvety-feeling surface. Then, just because I haven't played with my air brush and Copics for ages, I sprayed graduated colour over the sparkle. I did then use a black Copic to dot over the flower heads, just to boost the contrast. Given that much glitter, I decided a simple treatment would be best so the piece just got a narrow black mat and a die cut sentiment. 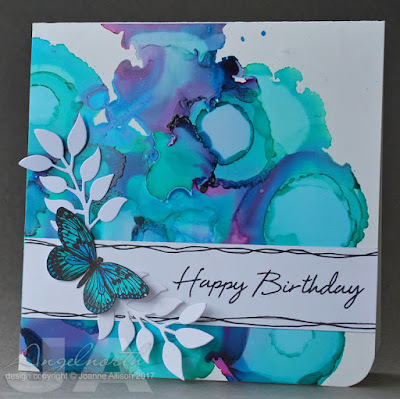 The first dare of the month from Daring Cardmakers is always an "elemental" one - just choose at least three elements from the inspiration picture for your project. I'm in the hot seat this month and I've chosen this lovely mood board from the folk over at Tanis Fiber Arts. I'm very late to the Yupo paper party but I've just treated myself to a pack and had a first play with it here to mimic the looks of the top right and middle left squares in the inspiration picture. The stamped butterfly is coloured with Copics and then has turquoise glitter pen over the top. Crisp white die cuts (inspired by the leaf sprig of the necklace) provide contrast for the busy, rich colours and a stamped sentiment and doodled border finish it off. 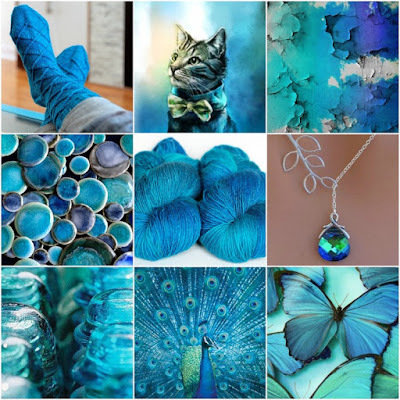 Do have a look at the DCM blog - it looks gorgeous with all the samples inspired by this picture!